"Bacon, an award-winning photojournalist, labor organizer, and immigrant-rights activist, follows the lives of undocumented workers at the Westin Suite Hotel in California and a Smithfield meatpacking plant in North Carolina, who travel back and forth from Mexico to the U.S. . . . He ties together interviews, personal histories, and political analysis to provide a vivid image of what life is like for workers with little rights or protections in an increasingly globalized economy." "[I]ncisive investigation . . . Bacon’s timely analysis is as cool and competent as his labor advocacy is unapologetic. 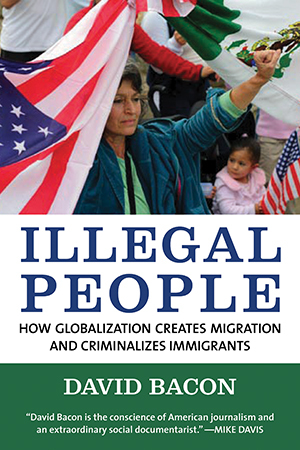 In mapping the political economy of migration, with an unwavering eye on the rights and dignity of working people, Bacon offers an invaluable corrective to America’s hobbled discourse on immigration and a spur to genuine, creative action."